Rocky Sullivan was very happy with himself. He threw the empty spray bottle away and snuck out the back door. He jumped in line with his class outside. The teacher did not even realize that Rocky Sullivan was missing from her class because he made it out just in time for her to call the roll. Since Rocky was trying to be so sneaky and was in such a hurry to get to his evil plan, he did not notice that Mrs. Yankey was still inside the building while Mrs. Loerch took the students outside. The alarm abruptly stopped ringing and all of the students at Loch Lomond quickly and ever so quietly turned towards the school to return to their classrooms. Crystal Margine was another student in the second grade at Loch Lomond. She was the complete opposite of the evil Rocky Sullivan. She was extremely smart and she loved to read. Crystal always finished her work ahead of time and loved to use her extra time to read. Crystal often got lost in her books. She imagined herself as a character in the books she loved to read. Since they had just returned from the fire drill, everyone had to go back to their seats and finish their second grade research projects on life cycles. They looked forward to their research projects and loved all of the help they got from Mrs. Yankey, Mrs. Loerch and the teachers. Crystal had already finished her project, so she asked her teacher if she could go to the library to exchange her books. Of course, her teacher allowed her to go. When she arrived at the library she promptly returned her books and journeyed to the section of Junie B. Jones books. She loved to read Junie B. Jones and the Magic Tree House books about Jack and Annie’s adventures. This particular day she saw her favorite book called Junie B. Jones has a Monster under her Bed. She reached up to pull the book from the shelf to do the “5-finger” test that she learned from Mrs.Yankey during library encore time. As she began to read, the evil plan that Rocky Sullivan devised began to work its’ magic. Suddenly, before Mrs. Yankey’s eyes, shooting stars came popping out of the book along with an annoying boy’s voice saying, “There’s a monster under your bed”. The stars circled around Crystal and completely engulfed her as they pulled her into the book. Mrs. Yankey was completely in shock and she thought back to the fire drill. She remembered seeing Rocky in the hallway all alone and in a hurry. She had just thought he was trying to get out of the building. Then she started to think some more and she remembered finding a strange can in the library trash can. She just could not put everything together to make sense. And then, before Mrs. Yankey’s eyes, Junie B. Jones was in the library in her bed and Crystal Margine was nowhere to be found! Mrs. Yankey and Mrs. Loerch screamed loudly when the Monster came out from under the bed. Junie B. Jones was surprised that she wasn’t in her bedroom. The Monster started to scare all the students who were in the library. Mrs. Yankey and Mrs. Loerch moved the students, who were in the library, into to the hallway and told them to go back to their classroom. Then they locked the library doors. Mrs. Yankey and Mrs. Loerch wanted to make sure that the Monster stayed in one place. Junie B. Jones was frightened because there was a monster in the library. The Monster began to STOMP around the library. He was taking books off the shelf and throwing them all over the library. Mrs. Yankey was upset! The Monster wasn’t using a shelf marker! Everyone knows that that you are suppose use a shelf marker in the library. The Monster was making a mess and he was knocking over things, even the trash can. A strange can rolled out of the trash can and onto the floor. Mrs. Yankey picked up the strange can and looked at it. On the outside of the can was a big red X over a book. Mrs. Yankey got a strange feeling. She thought that maybe the can had something to do with Junie B. Jones and the Monster from under her bed being in the library. In the meantime, Mrs. Loerch was trying to keep Junie B. Jones calm and safe but Junie B. Jones kept asking lots of questions. Junie B. Jones was becoming very annoying. The Incredible, Super, Wonder Librarian grasped her library pointer and pressed a button on the end and it became a magic pointer. She tapped the crayon box and instantly, the crayons sprung out of the box. They created an extraordinarily, colorful road leading to the Junie B. Jones book that had started all the trouble. Next, the Incredible, Super, Wonder Librarian used her magic pointer to bring the library’s stuffed animals to life. The green dragon, curious George, Winnie the Pooh, Clifford, the colorful elephant, the Cat in the Hat, the brown scorpion and the Hungry Caterpillar quickly made a parade on the colorful road. All the stuffed animals joined their arms and skipped down the road. Junie B. and the monster watched the stuffed animals and they became curious. The Cat in the Hat waved his hand to have them come join them. So, the Monster and Junie B. hurried over and joined the parade. Meanwhile, the Super, Incredible, Wonder Librarian picked up the Junie B. Jones has a Monster under her Bed book and waved her magic pointer and said, “Book, become BIG!” Immediately, the book grew to life size. When the stuffed animal parade reached the life sized book they started jumping over the book. When the Monster and Junie B. tried to jump, the Incredible, Super, Wonder Librarian pushed them with her super strength and they fell into the book. They disappeared and Crystal climbed out of the book. She said that she had climbed over the Monster and Junie B. as they fell into the book. The Incredible, Super, Wonder Librarian asked the office to call Rocky Sullivan to come to the library. When he arrived, Rocky knew he was in trouble. He decided to escape into a book. He saw Shark Attack on display and jumped into the book. Nothing happened! He was still in the library! Then Rocky knew his spray had worn off. The Incredible, Super, Wonder Librarian told Rocky he could be a great scientist if he learned to read. He said he was an evil villain, but he would like to learn to read. He promised to be a better student and try to do his best in school. Then the Incredible, Super, Wonder Librarian said, “The power of books, the power of books, the power of books.” Suddenly, there was another explosion. 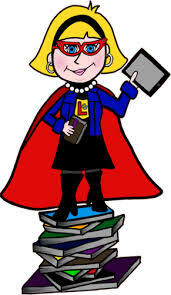 Thunder and lightning filled the room and Mrs. Yankey was standing in the middle of the library. Crystal was surprised to see Mrs. Yankey and she promised not to tell the secret of the Incredible, Super, Wonder Librarian. Then, Crystal returned to her classroom with a new library book. This entry was posted in 2013/14 School Year, Mrs. Wright's Class, Second Grade. Bookmark the permalink. You guys are awesome when you guys think! I like when the super librarian said the power of books. I like that their was thunder in the library.